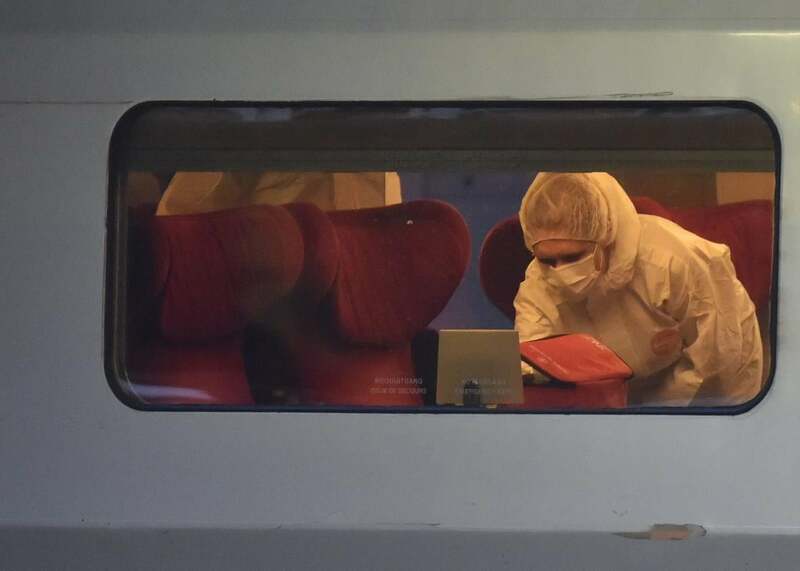 Police inspect a crime scene inside a Thalys train of French national railway operator SNCF at the main train station in Arras, northern France, on Aug. 21, 2015. Many details are still awaiting confirmation, but a heavily armed man was subdued by passengers after opening fire on a high-speed train traveling from Amsterdam to Paris on Friday. A local paper has reported that the attacker was “taken down” by two off-duty U.S. Marines on the train, and other reports suggest that they were the only ones injured. The well-known French actor Jean-Hughes Anglade suffered minor injuries while breaking the emergency glass to pull the train’s alarm. The train was driving through Belgium at the time, but the suspect was arrested in the border town of Arras, France. The suspect is a 26-year-old Moroccan who authorities say was previously known to intelligence services. Agence France-Presse reports that the man had several weapons including guns and razor blades in his luggage and was armed with a Kalashnikov. The authorities have not yet identified a motive, and a spokesman for the interior ministry said it is “too early to speak of a terrorist link,” however the case has been taken over by counter-terrorism investigators. Interior Minister Bernard Cazaneuve, who has traveled to the scene, said that the Americans who subdued the attacked “particularly courageous and showed extreme bravery in extremely difficult circumstances.” It’s also not clear if the Marines were targeted or if the shooter just really picked the wrong train car. For French-speaking readers, our colleagues at Slate.fr have more on the attack and the investigation.